The Central Bank is losing its battle with the local Iranian gold and foreign exchange markets. Central Bank governor, Mahmoud Bahmani, has been struggling futilely with market forces for a few months now, to prevent potentially profound devaluation of the Iranian rial. For years monetary policy has been based on clutching the rial against the USD despite double digit inflation and directive bank deposit rates lower than the rate of inflation. It seems that at last people are losing their confidence with the rial and exchanging their rial based capital to non-rial liquid asset classes such as gold and foreign currencies to safeguard their resources. Impending political tension and power struggles between the Ahmadinejad camp and the principalist camp in the upcoming parliamentary elections, which may generate administrative and political instability. UN and US financial sanctions that have virtually dismantled Iran's international financial transactions for trade and hence the economy. Consequences of economic and financial mismanagement and inappropriate monetary and fiscal policies of the ninth and tenth governments. These factors are rapidly increasing Iran's risk as a whole. There is a lot of talk about speculative bubbles in Iran's gold and foreign exchange markets without paying any attention to how risks of investment, stagnation in economic activity, and devaluation of bank deposits are quickly creeping into people's distrust of the economic system. By taking into account all these issues, one will conclude that there is no bubble at all. Perhaps the rial is finding its true value. These are not normal times for Iran. The evaluation of interventionist and directive monetary and fiscal policies has been mostly negative when looking at overall economic performance. The role of government is not to take the place of the marketplace, but to improve the functioning of the market economy. This is where the government of Iran has failed. Low economic growth in the past few years is a clear indication of the deceitful role the government in the economy. Further, any decision to regulate or intervene in the play of market forces must carefully balance the costs of such regulation against the benefits that such intervention will bring. This obviously has not happened. During the 6.5 years of Ahmadinejad's presidency more than $470 billion of oil income has entered the government's treasury, thanks to high oil prices. The mechanism that the government uses to provide for its local currency budget is to sell the foreign currencies that has earned to the central bank and instead the central bank delivers rials to the government. Essentially the central bank prints this money and reserves the foreign currency to back the printed rials. These foreign currency deposits form the foreign reserves of the central bank. The current figure is estimated $75 billion. The government also owns a sovereign reserve account that was established back in 1999 to balance the budget at times of economic distress. Based on the current information this account is practically empty, which means the government has been unable to save any of its foreign currency earnings in recent years. 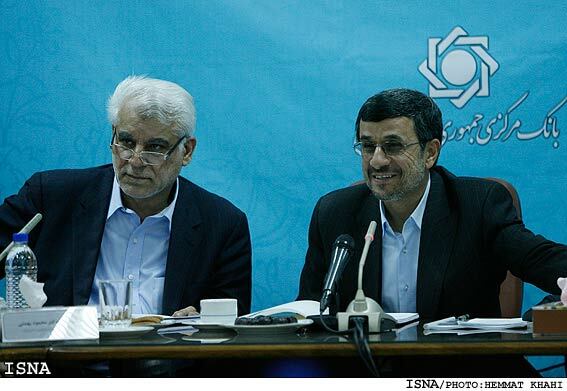 Therefore, the difference between the $470 billion of oil income and ($75 billion of foreign reserves subtracted from the balance of foreign reserves when Ahmadinejad took office) is the amount that the government has spent for various purposes such as imports, debt payments, and other expenditures to fulfill its foreign currency needs. Importing goods is also another way the government utilizes to exchange its foreign currencies with rials to provide for its local currency budget. While it will not come as a major surprise to most, Iran has been actively purchasing gold well over the amount reported to and by the IMF, in an accelerated attempt to diversify its reserves away from the US dollar, in a sign of growing political pressure. Market observers believe Tehran has been one of the biggest buyers of bullion over the past decade after China, Russia and India, and is among the 20 largest holders of gold reserves with an alleged 300 tons or 9,600,000 oz. If the gold price is assumed $1,600 per oz. today, Iran's current gold value amounts to about $15.4 billion. Since a year ago when the targeted subsidy plan was implemented, the amount of liquidity has increased approximately by 80,000 billion tomans (10 rials = 1 toman) from 270,000 billion tomans to 330,000 billion tomans. If the official dollar exchange rate of 1,100 tomans per dollar is assumed, the amount of liquidity is equivalent to $300 billion. If the market exchange rate of 1,500 is assumed, the amount is equivalent to $220 billion. In many occasions Mahmoud Bahmani and other government and central bank officials claimed that Iran has enough foreign currency reserves to supply for all foreign currency demands. In addition he claimed that Iran has sufficient gold reserves for the next ten to fifteen years to cater for all future gold demands. What they did not mention were at what rates and prices? Furthermore, central bank and government officials persistently assert that the dollar rate of 1,100 tomans is well justified and accuse speculators and brokers of driving it up. Just a simple calculation based on the above figures can indicate that with the current rates and prices both the foreign currency and gold reserves may be wiped out like a sky lightning if people loose their confidence in the rial. As was mentioned in the previous paragraphs, the existing liquidity in the economy based on ongoing exchange rates is at least two times higher than the foreign exchange deposits. If the current risks persist or become worse, to safeguard their domestic capital, the people will rush to buy foreign currencies, gold, and other liquid foreign currency dependent assets. With present low deposit rates, high inflation, and above all high country risk, the possibility of bank run to convert rials to other assets will increase dramatically. Consequently, if just a fraction of existing stray cash in the economy suddenly moves to acquire foreign currencies and gold, foreign exchange rates and gold prices will skyrocket. This is a very credible scenario and all signs clearly indicate it. Therefore, the claims that there are enough foreign reserves to steady foreign exchange rates as well as gold prices are merely myths. Central Bank officials are horrified of collective bank withdrawals and; hence, they try to obscure the existing risks. Iran has gone through many foreign exchange policies. The latest one has perhaps fixed the rial to a basket of currencies. It is called the managed floating rate. This means that the value of the toman (10 rials = 1 toman) does not vary independently against the values of other currencies. Every morning before noon the central bank announces foreign currency exchange rates. This policy is unstable and has caused many problems for the economy. At present there are 3 or 4 different rates used. Of course one of which is the unofficial rate. The gap between the unofficial rate and the central bank reference rate is increasing on a daily basis. The entities that have access to the reference rate also have access to tremendous rent opportunities. If the central bank maintains its stubbornness to keep its exchange rate steady, it will need an inexhaustible source of foreign assets and should be ready to ravage it to maintain the exchange rate at the current levels. During the past few years, thanks to unprecedented increases in petro prices, the central bank had enough resources to follow this policy. But at the present time that financial sanctions are increasing Iran's country risk and economic mismanagement of the administration is rapidly worsening economic conditions in addition to the targeted subsidy plan, the government is encountering a massive budget deficit; therefore, the oil revenues may not be enough to cater for the fixed exchange rate strategy. 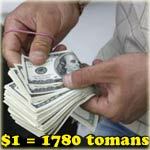 In that case, a sudden plunge in the value of the toman against other currencies is expected. However, if the petro dollars are enough to cater for the fixed exchange rate strategy, the oil income that is actually the wealth of the people of Iran will be squandered further. So far, due to this course of action monetary policy has been ineffective. In a nutshell the dollar should have gradually appreciated in the past few years, but because of inexplicable monetary policy behavior it was kept relatively steady only and only as a result of oil windfalls; not economic growth. What matters today are instable markets, uncertain future, and passive and faulty central bank solutions. Unless the current risks are reduced, this chaos and instability will persist. About the Author: Amir Naghshineh-Pour (MBA) is a financial and business professional.